This protocol can be used to produce lentivirus from a lentiviral vector transfected into Lenti-X 293T cells using a polyethyenimine (PEI) transfection protocol. This procedure can be modified for alternative packaging cell lines or transfection reagents. Once produced, lentivirus can be used for a variety of downstream applications such as stable-cell line generation. *Pro-Tip* Different brands and lots of FBS can promote or inhibit transfection. Test a variety of brands and lots of FBS to find one suitable with your protocols. FBS can be purchased already heat inactivated or it can be inactivated in the lab by heating to 56 ℃ for 30 minutes. Dissolve 0.129 g of chloroquine diphosphate salt in 10 mL of sterile water. Filter sterilize through a 0.22 μm filter. Aliquot 50-100 μL and store at -20 ℃. Dissolve 100 mg of powder in 100 mL of deionized water. Check the pH of the solution. *Pro-Tip* The pH of this solution will drift rapidly upon addition of acid or base. Add only a few drops at a time, allow them to mix and recheck the pH to prevent over or undershooting the desired pH. After thawing, the solution can be stored at 4 ℃ for up to 2 months. After 2 months, discard the tube and thaw a new working stock. The optimal mass DNA:mass PEI ratio will need to be empirically determined for each new batch of 1 mg/mL PEI and for each cell line. The health of the packaging cell line is critical for obtaining high viral titer. Monday: Plate 1×106 cells in a T75 flask in 15 mL DMEM complete. Wednesday: Plate 1×106 cells in a T75 flask in 15 mL DMEM complete. Friday: Plate 8×105 cells in a T75 flask in 15 mL DMEM complete. Do not add pen-strep to the media. Seed 293T packaging cells at 3.8×106 cells per plate in DMEM complete in 10 cm tissue culture plates. Incubate the cells at 37 ℃, 5% CO2 for ~20 hours. Gently aspirate media, add 10 mL fresh DMEM complete containing 25 μM cloroquine diphosphate and incubate ~5 hours. For 10 mL of DMEM complete, add 10 μL of 25 mM chloroquine diphosphate. *Plasmid concentrations and ratios should be optimized for each transfer plasmid. *Pro-Tip* Endotoxins can inhibit transfection, therefore, plasmid DNA purification should include an endotoxin removal step. For high quality plasmid DNA, the plasimd should also be propagated in an endonuclease negative E. coli strain such as NEB stable. Dilute the above 500 μL mixture into 500 μL PEI-OptiPro SFM with enough PEI such that the ratio of μg DNA:μg PEI is 1:3 (1000 μL total per 10 cm dish). Using transfer plasmid pHAGE TRE dCas9-KRAB (total ug of plasmid DNA 27.8 μg), this would be 83.4 μL of 1 mg/mL PEI in 416.6 μL of OptiPro SFM per 10 cm dish. *Pro-Tip* There can be batch to batch variation when making the PEI working stock, therefore the ratio of μg DNA:μg PEI needs to be empirically determined. Once a batch of PEI is prepared, transfect cells with a fluorescent plasmid using a variety of ratios. Check the cells 1-2 days after transfection to determine what ratio gives the highest percentage of GFP positive cells. Incubate the cells for 18 hours, or until the following morning. Virus can be harvested at 48, 72, and 96 hours post transfection in individual harvests or a combined harvest where all the individual harvests are pooled. If pooling harvests, transfer the harvested media to a polypropylene storage tube and store at 4 ℃ between harvest. Centrifuge the viral supernatant at ~500 g for 5 minutes to pellet any packaging cells that were collected during harvesting. Filter supernatant through a 0.45 μm PES filter. The viral supernatant can be stored at 4 ℃ for several hours but should be aliquotted and snap frozen in liquid nitrogen and stored at -80 ℃ as soon as possible to avoid loss of titer. Figure 1: Lenti-X 293T cells were transfected with the GFP-expression plasmid pRosetta using μg total DNA to μg PEI ratios of 1:1, 1:2, 1:3 and 1:6. The 1:2 and 1:3 total DNA:PEI μg ratios provided high transfection efficiencies as measured by the highest proportion of GFP positive cells without limiting cell growth. 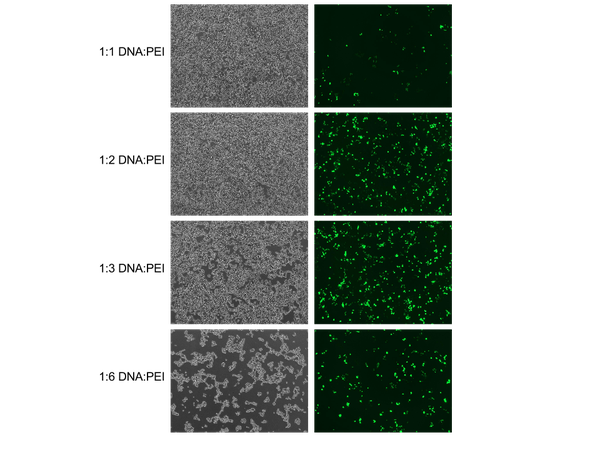 Left panels: bright field images; right panels: GFP channel images.